The sun will always set here, melting into the Delaware Bay each night, just as it did long before the area had a name or roads to get here. But the summer residents of this tiny hamlet in Fairfield Township, Cumberland County, some of whom met their spouses here and live in homes that have passed through generations, fear that their sunsets are numbered. The New Jersey Department of Environmental Protection has extended buyout offers to most of the 19 homeowners on the dirt-and-stone road known as Beach Avenue. But those checks, residents say, cannot replace the memories or wash off the bitterness that recently has stained them. 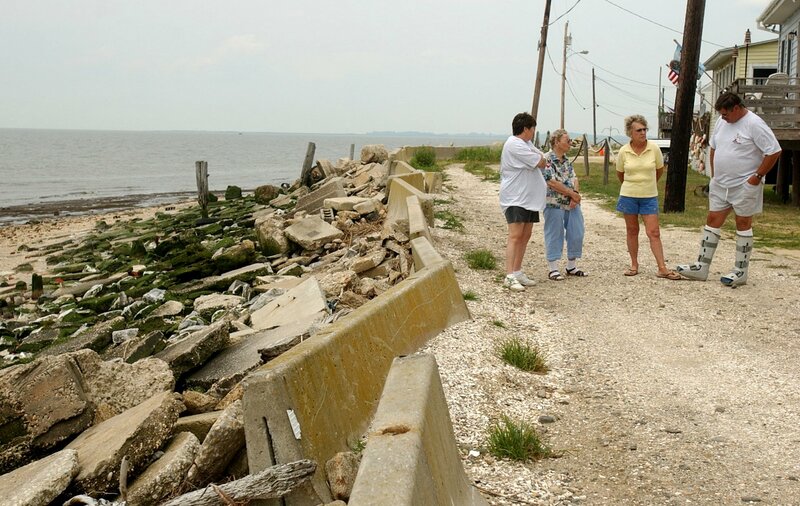 The buyout, Beach Avenue residents say, is the state’s attempt to rectify the recent construction of a $1.8 million seawall that wasn’t seaworthy – a project they hoped would guarantee Sea Breeze for future generations when it was finished two years ago. Today, the undulating seawall of concrete blocks laid atop mats resembles the waves it was meant to keep out. Some sections have collapsed, leaving behind dangerous caves and crevices. Len Fariello says he rescues dozens of trapped horseshoe crabs from those caves every time he visits Sea Breeze. David Rosenblatt, administrator of the DEP’s Office of Engineering and Construction, says funding issues, environmental concerns, a change of administration in the township and the simple, brute force of Mother Nature led to Sea Breeze’s precarious situation. In other coastal towns, boulders are piled atop one another to create seawalls, Rosenblatt said, but that type of project would have cost as much as $4 million at Sea Breeze – with no guarantees that it would work. “It’s a tough area to protect, and that’s the bottom line,” he said. Fariello said Wildlife Preserves is considering a lawsuit against the DEP and the contractor that built the wall. Cherry Hill lawyer Donald Nogowski said legal action by some of the homeowners he represents has not been ruled out. He said that the state should spend stimulus money or that Fairfield should declare Sea Breeze a redevelopment area. “The town and the DEP are both pointing fingers at each other, but they’re both responsible,” he said. Karen Hershey, a DEP spokeswoman, said the state’s buyout offers, which residents say range from $150,000 to a little more than $200,000 per property, will last until the end of the year. The DEP will not force anyone to leave Beach Avenue, she said, but nor will the DEP fortify the wall or maintain Beach Avenue. On a recent summer morning along Beach Avenue, it seemed like nature already had taken over. Diamondback terrapins emerged from a hole in the seawall and slowly scuttled over rubble toward a beach loaded with dead horseshoe crabs. Dragonflies appeared by the thousands, hovering like iridescent helicopters as they zeroed in on other flying insects. In backyards, tough-looking fiddler crabs retreated into the muddy creek bank at the slightest vibration, and farther beyond, in the salt marsh, a bald eagle sat atop a barren tree, eyeing up its breakfast. After 30 minutes, a human appeared. Home to large hotels, amusements and a bar in the late 1800s, Sea Breeze was once a popular riverboat stop for tourists from Philadelphia. According to Rosenblatt, previous administrations in Fairfield believed Sea Breeze could be a popular destination again – for ecotourism – when they first approached the DEP more than a decade ago. As part of the initial agreement during the construction of the seawall, the township agreed to take over ownership of the wall and maintenance of Beach Avenue. Mayor Marion Kennedy said the township of 7,500 simply doesn’t have the money to fix Sea Breeze’s problems and safeguard the dozens of people who call Beach Avenue a second home. “The whole thing, the deal done with DEP, it just didn’t turn out the way we wanted it to,” Kennedy said. “It’s not a point that the township wants everyone out of there. They could be down there forever if it worked. Geography dictates that this is a Jersey Shore town – but it’s unlike any Shore town in the state. It has no traffic, no parking meters, no boardwalks, no miniature-golf courses, nowhere to buy sunscreen or coffee or even fresh seafood. “Buy it? We catch it!” said resident Bob Spence, whose Carolina Skiff is moored in “the creek” about 10 feet from his back door. When residents do head to the supermarket, 20 minutes away in Bridgeton, they have to check the tides first. If they miscalculate, the bridge on the lone road in and out may be flooded. The only real store in Sea Breeze, residents say, is the home next door, where you most likely can borrow whatever you need, even if no one’s home. Most homeowners here are related, or feel that way. Some residents, like Joseph Hepner, bought their homes specifically because the seawall had been built. Hepner spent more than $100,000 refurbishing his home on the southern end of town with a deck overlooking the bay and an inflatable hot tub on the roof. Most Beach Avenue property owners feel the same way, some refusing to return here anymore because the sunsets are simply too painful to bear.